News transcript courtesy of News Channel WGBH Boston, a subsidiary of OmniCorp. Recorded on June 15, 2006. Emergency press conference held by Massachusetts Governor Mitt Romney. GOVERNOR MITT ROMNEY: Good morning. On Wednesday, June 14, 2006, the commonwealth of Massachusetts had an encounter with the forces of beyond. If initial reports are to be believed, then, as incredible as it sounds, our city is under attack. Ladies and gentlemen, the situation is grim. Massachusetts Secretary of Science Herman Neuberg has informed me that the commonwealth is under attack by zombie dinosaurs and a swarm of reanimated corpses. The lives of countless citizens are at stake. These killers are not terrorists or criminals. They do not attack out of any ideological reasons. They kill for food. Massachusetts police officers and National Guard soldiers are currently overseeing a mass evacuation of the city of Boston. I ask that the people of Boston leave the city immediately. This morning, my staff and I spoke with representatives from the Pentagon. Under the advisement of scientific and tactical professionals, I have called for a controlled nuclear strike on Boston. The city must be destroyed so that the state can survive. I will take your questions now. GOVERNOR MITT ROMNEY: Please! One at a time! Please! GOVERNOR MITT ROMNEY: I have reviewed all options! Diplomacy is impossible in this situation! You can’t bargain with these things! I –I…they do not feel pity or remorse! They drain the life from all they meet! As you walk around the bend, you’ll be dead right there where you stand! They will murder and devour everyone in the Bay State communities unless they are stopped now! This is no time for diplomacy! JOHNATHAN CONNOR, MSNBC: But surely, a nuclear strike? I mean…c’mon! GOVERNOR MITT ROMNEY: Listen to me, all of you! We're in a position where unless we take immediate thermonuclear action, we'll end up being the France of the 21st century! A lot of talk, but not a lot of strength behind it in terms of economic capability! I ask the assembled press: could you live with that? DAVID CLARKE-HAZLETT, NEW YORK TIMES: How do you expect to successfully evacuate the huge amounts of people? What you’re proposing is absolutely insane! GOVERNOR MITT ROMNEY: Alright! You keep pushing Clarke! Keep pushing! I’ve got major pressure, here! DAVID CLARKE-HAZLETT, NEW YORK TIMES: The people of Massachusetts and this nation demand an answer! GOVERNOR MITT ROMNEY: Look Clarke!… (long pause). Here’s your answer. I subscribe in some respects to what Abraham Lincoln said in – well, it goes to the Lyceum Address when, at age 28, he said, you know what, in America there is something called the political religion. It’s our adherence to the laws of the land, to our oath of office. It’s the political religion god dammit! GOVERNOR MITT ROMNEY: Next question! GOVERNOR MITT ROMNEY: I said next question Clarke! Get out of here! JACINDA KLEIN, LOS ANGELES TIMES: Does this recent zombie dinosaur attack confirm the earlier reports of a resurrected Tyrannosaurus-Rex, previously denied by your administration. GOVERNOR MITT ROMNEY: I have no comment to make. Next question! KEN YANCY, BOSTON GLOBE: Governor Romney, how do you respond to the recent carnage at the Massachusetts state Boy Scout meeting, wherein over one hundred scouts were killed? GOVERNOR MITT ROMNEY: I have let my views be known on several occasions. I have been to one board meeting now with the Boy Scouts of America Committee. I believe that the Boy Scouts of America does a wonderful service for this country. It is important that our children are taught how to hate. I support the right of the Boy Scouts of America to decide what it wants to do on that issue. MARCUS BLACKBURN, ABC: How will this outbreak of zombies and the nuclear devastation of Boston affect the Massachusetts economy? GOVERNNOR MITT ROMNEY: Well obviously, we have some tough times ahead of us. I think that the people of Massachusetts understand that. But, as governor of this state, I refuse to let these zombies stand in our way! The Massachusetts economy is strong! We’re not going to fall! Oh no! Not on my watch! MARCUS BLACKBURN, ABC: To follow up on that, many economists are pointing to the rising economic strength of China as a potential threat to the United State’s economic influence of the world. Do you believe China to pose a threat to Massachusetts, perhaps more than the zombies? GOVERNOR MITT ROMNEY: Listen, China has a huge population, and is nearing a point where they’ll be at the leading edge of technology. They’ve got the Red Book, the new look. They have the answers to all the questions. All the people living in China…there's no reason why they can't emerge as an economic and military superpower in 100 years. Zombies, well I hear that they eat brains. I think we all know who the greater threat is. No way am I letting China take out Massachusetts! No way. I’m not letting them threaten traditional Christian marriage! GOVERNOR MITT ROMNEY: Next question, slime! HARRY MYERS, WASHINGTON POST: Governor Romney, you’ve made it clear in the past that you’ve heavily agreed with President Bush’s homeland security policies. Do you see this…apocalyptic zombie invasion as a failing of those policies? GOVERNOR MITT ROMNEY: No. No, I don’t. HARRY MYERS, WASHINGTON POST: There have been those who have asserted that the zombie dinosaurs in Boston are a clear indication that better preparedness is needed to effectively protect the city’s population. GOVENOR MITT ROMNEY: Well my response to that would be that a key part of our homeland security efforts rests on the state’s ability to collect and analyze information on potential threats. Now, who among us could have seen this coming? HARRY MYERS, WASHINGTON POST: What of the previous attacks on Boston by zombie dinosaurs? GOVERNOR MITT ROMNEY: Look what is it with you people? MARTHA QUAID, SEATTLE POST-INTELLIGENCER: Governor Romney, how do you feel about the massive amount of private property that will be destroyed in this nuclear attack, and the irradiation of many thousands of square miles of real estate? Isn’t this a great infringement upon people’s civil liberties? GOVERNOR MITT ROMNEY: Well, of course, we have to respect the Constitutional guarantees of freedom, but we ought to recognize that the most important civil right we have is the right to life! We need to make sure that our citizens are protected and don‘t lose their lives by virtue of not having done an effective job to obliterate those who would attack us. The most important thing that we have to do is to protect our citizens, and we can do it within a constitutional framework that we‘ve come to know and love. It doesn’t say anything about not using nuclear weapons in the Constitution! We go nuclear. Next question. 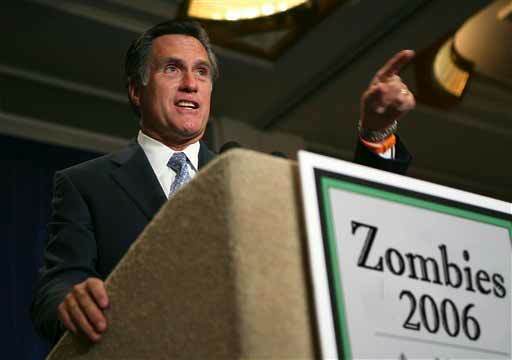 SARA RAO, CBS: Governor Romney, a lot of people are asking why the Massachusetts state government hasn’t pursued the option of hiring a zombie extermination business. In the past, Boston’s more minor zombie problems have been dealt with by a company called Jim Rage’s Elite Zombie Hunting Squad. Did you ever make any such considerations? GOVERNOR MITT ROMNEY: Hah! Very clever! But not clever enough Ms. Rao! The corporate headquarters of Jim Rage’s Elite Zombie Hunting Squad was found destroyed and deserted a week ago. They’ve abandoned us. They’ve left us! We must resort to our own means to deal with this crisis. SARA RAO, CBS: But where are they Governor? Where is Jim Rage’s Elite Zombie Hunting Squad? GOVERNOR MITT ROMNEY: Who the hell knows? Next. TECUMSEH O’BRIEN, VALLEY NEWS: Governor what are your views on America’s foreign oil dependency? End of recording. End of transcript.